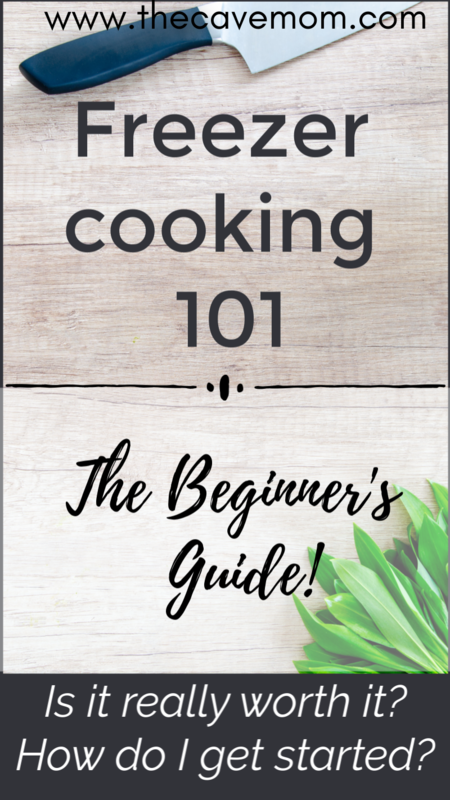 Before we get into the nitty gritty of the beginner’s guide to freezer cooking, let’s talk about what exactly freezer cooking is! Freezer cooking is simply prepping food and storing it in your freezer to eat at a later date. When people think of freezer cooking, many times it brings to mind images of freezer burned casseroles, with a heavy emphasis on using canned cream of mushroom soup. No wonder moms don’t get excited about the idea! Freezer cooking is far different today than it was 30 years ago, and you totally don’t have to EVER use cream of anything soup if you don’t want to! So how can freezer cooking help you? Freezer cooking saves you time. It doesn’t take 4 times as long to make 4 pans of baked ziti rather than 1 – it only takes a little longer. Bulk cooking gets you multiple meals with very little extra time up front, so you spend less time cooking for the whole month. Every time I pull a homemade already prepped meal out of the freezer it feels a little bit like a magic trick 😉 Y’all. You can go sit on the couch and scroll pinterest while supper is cooking! Or, you know, do laundry or bathe the children. Freezer cooking saves you money. Because you’re heading into the grocery store fewer times, you’ll be spending less on impulse buys. Also, careful planning is essential to freezer cooking, so you get exactly what you need and no extra! Spoiled food waste is a common problem and budget concern, and freezer cooking eliminates this. When you’re cooking multiple meals in big batches at the same time, you’ll use a lot of the same ingredients. Think ground beef, onions, crushed tomatoes, etc. So, you can buy in bulk and save money that way. 20 lbs of potatoes might not make sense to buy for a week, but when you’re prepping 4 large shepherd’s pies for the freezer, you’re definitely going to want that big bag. Freezer cooking helps you eat healthier. Of course, it just makes sense that if there’s a meal already made at home, you won’t be as tempted to run through the drive thru lane. Because you’re carefully planning a freezer cooking day, it’s easier to choose healthier recipes to feed your family all month long. If you’re rushing through the grocery store trying to meal plan and shop on the fly, you’ll be more tempted to grab a short cut meal. When you’re freezer cooking, you’re going to be making healthier choices just by cooking from scratch and controlling the ingredients. Freezer cooking saves you dishes. Ok, so this should probably go under saving you time, but I feel it deserves its own heading, because I kinda hate washing dishes! When you cook at home, of course there are so many benefits, but there’s no getting around the dirty dishes at the end. But with freezer cooking, you’re making four meals of soup and washing the big pot, cutting board, and knife once. You get multiple pans of pasta, and you only had to scrub the darn strainer once time. And you chopped onions for 14 meals and the knife and cutting board only have to be washed once. That’s a lot of dishes saved! What kinds of food can I freeze? Probably more than you think! I freeze pretty much anything other than potatoes, rice, and pasta in soup (although it does just fine in a casserole!). Potatoes and rice tend to get mushy when frozen and reheated, and no one likes that. Potatoes have some exceptions, though. Frozen precut potatoes (like shredded hashbrowns) freeze great if you keep them frozen while assembling the dish – think breakfast casserole. Twice baked potatoes also do great in the freezer! But raw chopped potatoes in a soup or casserole get rubbery and mushy (all at once, how is that possible even?! ), so I never freeze them raw. 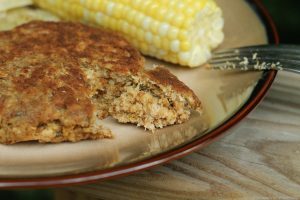 You don’t need to use only freezer-specific recipes (although Jessica Fisher has a whole category of great freezer-friendly recipes!) when you’re creating a freezer cooking plan. Just check out the ingredients and see what you think. If a soup calls for rice, I just leave that out and freeze the rest of the soup. Then, when it’s time to serve, I add the rice and allow time for it to cook completely. Same with pasta in soups. So if you have a favorite family recipe, you can probably freeze at least part of it! Can I do freezer cooking if I don’t have a deep freezer? No worries, you don’t even need one! They’re nice, and I have a small chest freezer (craigslist is a great place to get a cheap one used), but they’re not essential. You’ll just want to be sure to clean out your refrigerator’s freezer really well before you start freezer cooking, and be mindful of how much space you do have when you’re choosing recipes. If you don’t have much freezer space, you probably can’t fit 30 full meals in 13x9” foil pans, but you CAN fit an awful lot of soups, taco fillings, and crock pot meals frozen flat in ziploc bags. After frozen solid, they stack like file folders! You’ll be surprised how much food you can manage freezer cooking without a deep freezer. Not much. There are plenty of things that are nice to have, but the only essentials are basic cooking equipment. A stove, a cutting board and knife, some pots and pans, and a fresh stack of kitchen towels and you’re good to go! Are there different ways to freezer cook? Cook for a day, eat for a month. It’s a dream, right? I love to do a big freezer cooking day, because then meals are on autopilot the rest of the month, and it saves me lots of brain power for weeks. This is ideal for busy seasons of life, when your focus is needed elsewhere (but everyone still has to eat!). The drawback to this method can be that it’s just plain hard work to get that much done in a day. I notice that after about six hours in the kitchen, I’m kinda over it, haha. Also, if you have small children, you’ll need someone to care for them so you can cook for a day. A Saturday when Dad is home is ideal! There are ways around this – you can break your cooking into chunks, so some before the kids get up in the morning, a chunk after they eat breakfast and settle in to watch a movie, another chunk during afternoon naps, and then finish up after they go to bed. This makes for an awfully long day for you, although I have done this many times! You can also trade childcare with another mom who also wants to do some freezer cooking. Each of you will take a day to cook while the other mom keeps all the kids, then swap roles the next day. Multiply your meals for a week. Because it doesn’t take much more time to make a recipe x4 than just for one meal, you can also spread your freezer cooking over a week. 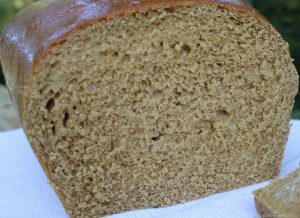 Simply make each supper recipe x4 at your normal cooking time each evening, and serve one for supper that night, and package the others to freeze for the next three weeks. This is how I currently do most of my freezer cooking. 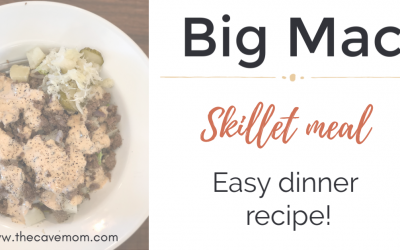 I think it’s the easiest for getting started freezer cooking; you’ll avoid getting overwhelmed, but still get the benefits of three weeks of meals in your freezer! The drawbacks to this method are that you won’t save as many dirty dishes (sad face), and if something comes up midweek, you’ve still got a fridge full of food you need to cook and freeze. Like if your kids start throwing up and you’ve got 20 lbs of chicken to cook. Ask me how I know this. 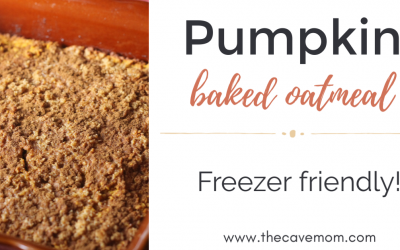 Freezer cooking isn’t all about full meals and complicated recipes! Simply having a few meals of your mom’s famous spaghetti sauce in the freezer and some marinated chicken ready to throw on the grill can save you so much time all month. What about things like homemade bone broth to cook rice in or quickly throw together a homemade soup? Quesadilla filling, cooked taco meat, pizza sauce, and homemade baby food are other freezer cooking ideas that will save you time, but aren’t full meals. Skip traditional cooking altogether and just plan a giant baking day! 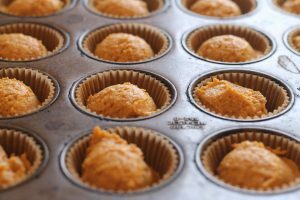 I confess, this is actually super fun for me, because I love to bake, so sometimes I do this just for my own enjoyment – but the added bonus is that then we have a freezer full of homemade bread, pizza crust, muffins, cookie dough, and scones. This is great if you like to have a big breakfast on the weekend but don’t want to cook it every time. Fresh scones I didn’t actually have to bake this morning? Can’t complain about that! You won’t save nearly as much time and money if you head into a big freezer cooking session disorganized. Planning is essential to your success! 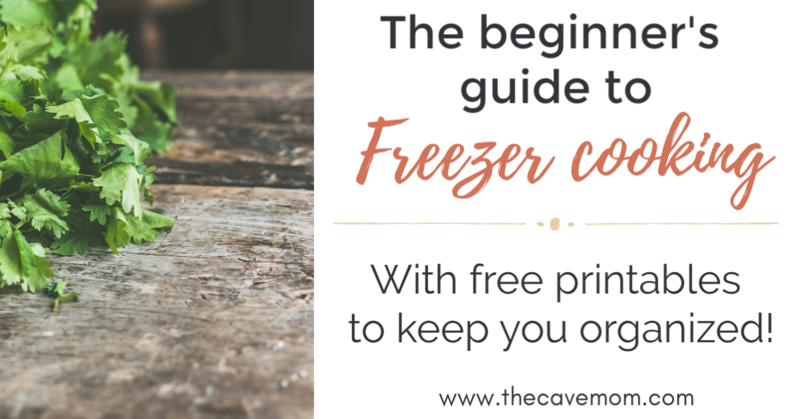 Be sure to grab my free freezer cooking printable pack to make this easy for you. 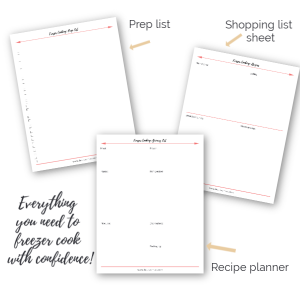 Check your email to download the freezer cooking printables and get started! First, decide what recipes you want to make. I start by meal planning for a month, then write the recipes I’m going to be freezer cooking on the recipe sheet of the printable pack. Next to each recipe, write the number of times you’ll make that recipe (For instance, coconut chicken soup, x4, taco bowl filling x4, sloppy joes x 6, etc.). Second, write your grocery shopping list on that sheet of the printable pack. I stand in my kitchen to do this, so I can check the pantry and fridge for what I already have or may be low on. Don’t worry about specific amounts just yet, simply list all the ingredients you need to buy for all your recipes. Third, tally amounts. This has two steps. 1. Look at your grocery list, and for each item, look back through your recipe sheet for much of that item you’ll need for a recipe, multiplied by how many times you’ll make that recipe. 2. Add together how much of that grocery item you’ll need in total. Example: Let’s say you need 1/2 an onion for shepherd’s pie, and you’re making 4 shepherd’s pies. You need 2 whole onions for shepherd’s pie. You’re also planning to make coconut chicken soup x4, and you need 1 whole onion for each batch. You need 4 onions for the soup. Add the onions from both recipes, and you’ll write a 6 next to onions on your grocery list. It sounds more complicated than it is. You just want a clear, specific grocery list with amounts written so you buy the right amount of the right ingredients! Also on your grocery list you want to write all the packaging supplies you need – foil pans, plastic wrap, ziplock bags, sharpies, etc. You don’t want to run out of places to put the food once you’ve cooked it all, so carefully tally up what you’ll need to package the food for the freezer, and add it all to your list. Fourth, write out your prep list. This will save you so much time on cooking day if you think through this when planning! Your prep list is basically your cooking day plan of attack. 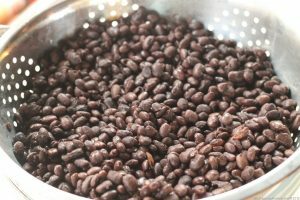 It will tell you step by step what to chop next, what to saute next, what to get going in the crock pot, etc. Planned carefully, it will make you super efficient in the kitchen, and save you even more time! You can skip this, but I don’t recommend it. If you’re cooking with little kids at home, someone is going to need a diaper change, and then a snack, or you’ll have to go answer the door for the Fed Ex guy, and the prep list makes it easy for you to mentally stay focused and jump right back on track with freezer cooking. Ok. Think through your kitchen equipment and the recipes you’re going to cook. What will you use the crock pot for? That probably goes first on your list. “Brown ground beef for spaghetti sauce. Add to crock pot with other sauce ingredients. Cook on low 6 hours. “Cook chicken breast for soup in instant pot. Chop veggies for soup, saute in large pot. Write out your steps in the way that makes sense for time and equipment. I also write my prep lists to where I have built in stopping points, so I can pull the plug if my kids start fighting a bunch. So don’t leave ALL the packaging and labeling for the very end – add stopping points in case you need a break in your day. 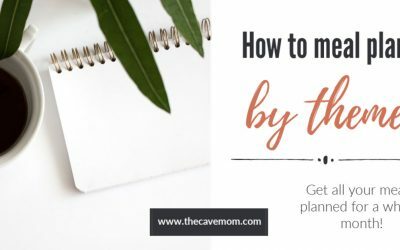 So you have a solid plan in place, and you’re ready to grocery shop! I do this the day before I’m going to start freezer cooking, bring it all home, and leave the nonperishable items right on the kitchen floor. No sense in putting it all away just to drag it all out tomorrow! I also try to do a little chopping that evening (peppers, onions, carrots), and maybe get a head start on the meat (boil some whole chickens, cook a bunch of the ground beef). If you can do this on grocery shopping day, it gives you a head start the next morning. 1. Sharpen all the knives I’m going to use. 2. Set out a stack of fresh kitchen towels and rags. 3. Take out the trash so I’m starting with fresh, empty bags in the kitchen. 5. Put on some comfy shoes. We don’t normally wear shoes in the house, but if I’m standing in the kitchen for 8+ hours, I’m going to wear my hubby’s hideous-but-comfy florescent orange crocs. Grab that prep list you wrote out and get cooking! If you wrote it thoughtfully, it’s as simple as following the steps on your prep list. You’ll probably run into some snags in the plan occasionally, but just keep working through your recipes. It’s nice if you have a big kitchen table to mix, assemble, and cool food on, but if you don’t, set up some makeshift work spaces to use. In our last (very small!) house, I set up cooling racks on the washing machine and dryer for freezer cooking days! Tip: Be sure to eat and drink water while you’re working! As you finish recipes and they’ve cooled a bit, start to package and label them. No, you won’t remember or be able to tell what’s in that bag once it’s frozen, so grab that sharpie and label it! Adding the date is also something you’re supposed to do, but I, uh, don’t think i’ve ever done that. I just write the name of the dish and the serving/heating instructions. Air and moisture around the food leads to freezer burn, so cooling the dish before you put it in the freezer, and carefully packaging to remove as much air as possible will help your freezer cooking efforts stay good for longer. I always use several layers of plastic wrap over pans, and seal bags tightly, squeezing as much air out as possible. It won’t be perfect, but it will help! Now pop that food in your freezer and get back in the kitchen to wash all those dirty dishes! I know. It probably doesn’t feel worth it right now. But mama, the first time you pull food out of your freezer, it will feel more worth it. You’ll be hooked, you’ll save yourself so much time and energy, and your family will eat better because of it. High five, mama!